Cowhide purses and handbags for sale. A cowhide purse is made of leather, and may or may not include hair on the cowhide. Below are cowhide purses, many of which have a Western design, for sale on eBay. There is usually a very good selection in different sizes and styles. Please scroll down for the difference between a purse and a handbag, and tips on buying a cowhide purse. Below: A beautiful, simply styled, cowhide purse. Is A Purse The Same Thing As A Handbag? These days, at least in the United States, the words "purse" and "handbag" are usually used to refer to the same type of item: A type of accessory carried by an individual that is used to hold personal items such as a wallet, keys, hair comb or brush, or a long list of other items the purse carrier chooses to include. In the past, though, a purse and a handbag were different types of items. 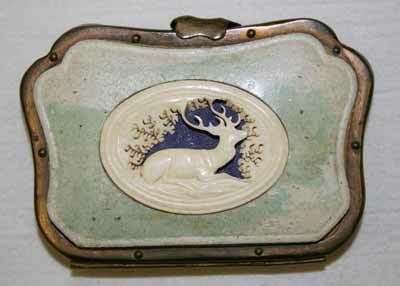 At one time the word "purse" was used to refer to a small pouch that held coins and/or paper money. A handbag, on the other hand, was the larger item (described in the previous paragraph) used to hold a variety of personal items, often including a purse. Below: A small purse made of metal, leather (cowhide) and paper, circa 1855–60. Located at the Metropolitan Museum of Art. Note the beautiful deer in the center. 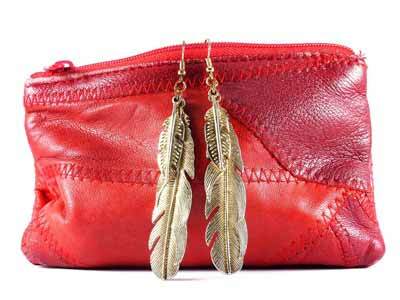 Below: A red cowhide purse. While cowhide purses are often desired for the beautiful, natural look of the cowhide, leather/cowhide does accept dye very well. This one has the best of both worlds: You can see the beautiful natural grain of the cowhide which looks great with the bright red color. Below are a few good things to know when buying a cowhide purse on eBay or anywhere else. Is the cowhide purse new or used? Most of the ones we have seen on eBay have been new but don't take this for granted. If the purse is used and you are allergic to smoke you may want to make sure it is from a smoke-free home. When it comes to cowhide purses, there are at least two definitions of cowhide: A leather purse or handbag, and a "hair on" leather purse or handbag. Some people use the words "leather" and "cowhide" interchangeably, while others use the word "cowhide" instead of "leather" to indicate the hair is still on the hide. Either way is a legitimate way to describe a purse. Is the cowhide purse real cowhide, faux cowhide, or something else entirely? For example, a cowhide purse could be genuine leather or cowhide, faux leather or cowhide that looks and feels very much like the real thing, or the "something else entirely" that we mentioned. Purses that are something else entirely might not have any cowhide (real or faux) anywhere in them, but the description in the listing might say something like "cowhide print" so they show up in the same list of items as real or faux cowhide purses. How big is the cowhide purse? Look for actual measurements so you know what you will be getting. If the purse is a "doctor's bag" or other style that opens wide at the top you may want measurements of the purse both closed and open. How many compartments does the purse have? Make sure the seller gives you an excellent description and/or shows you lots of photos. How is the purse designed to be carried? For example, does it have a shoulder strap, handles, or maybe both? How does the purse close? For example a purse can be closed with zippers, snaps, magnets, Velcro, etc. or a combination of ways. If you're particular about closures make sure the seller tells or shows in photos how the purse closes. Is the cowhide purse in the photos the same purse you will receive? Some eBay sellers are large stores that use stock photographs instead of using unique photos for each individual item. Most eBay sellers that use stock photos will say so in the description, so if you are in love with a photograph of a particular purse make sure to check the description to see if it is the same one you will be receiving or just a stock photo. How soon do you have to pay for your purchase? An increasing number of eBay sellers are getting tired of buyers who never pay for their item. Some of these sellers are now requiring the item be paid for within a certain time frame or the sale is off. Read the item description for acceptable forms of payments, time limit for the payment to be remitted, and any other terms. How much will the shipping charges be? Is shipping insurance included or is it extra if you request it? Can the purse be returned? Some eBay sellers allow returns but others strictly do not. If you are concerned about whether or not you will like your new purse be sure to find out the seller's return policy before you bid or buy.